Will Burrows does not fit in in school. He does not really have much of a connection with his family either; except that he and his father are both obsessed with archeological digs. They are fascinated with the past and love to dig under the ground to find the remains of forgotten times. 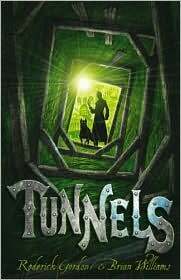 Will is particularly adept at digging tunnels and he and his father have found a long forgotten railway station under a rubbish dump. Will is now ready to see if his only friend Chester might be interested in the tunnels as well. So he shows Chester a section of the tunnels that he has been working on and Chester does indeed seem to be interested in Will’s all consuming hobby. Then Will’s father disappears. Will cannot understand what could have happened to his dad. He sets about going through his dad’s things trying to find clues. He comes across a diary and there are indications that his dad made an important discovery. While exploring the basement in Will’s house, the boys discover a tunnel behind a shelf. The tunnel has been blocked but the boys excavate it and once the way is clear they discover that the tunnel leads to a remarkable place far beneath the city of London. They find themselves in a world full of people who have lived their entire lives under ground. There, far away from fresh air, sun and rain, there are houses, streets, horse-drawn carriages, and a whole society which is governed by an a ruling class which calls itself the Styx. The Styx imprisons the boys, subjecting them to horrible sessions of interrogation. Will and Chester begin to wonder if they will ever see the light of day again. In this utterly compelling story readers will find themselves unable to resist the thrilling and fascinating pull of the tale as Will and Chester are drawn slowly but surely to their ultimate destination underground. Full of unexpected plot twists, this is a story which holds on to the reader to the very end. Without a doubt readers will be eagerly waiting for the sequel, wanting to find out what happens next.